The first of two days of schools’ football cup finals started today for players in the Forth Valley Schools’ FA. In bright sunshine under the Ochil Hills at the home of Alloa Athletic FC the Senior Trophy Final for the Falkirk Cup took place between Graeme HS and St Mungo’s HS both from Falkirk. 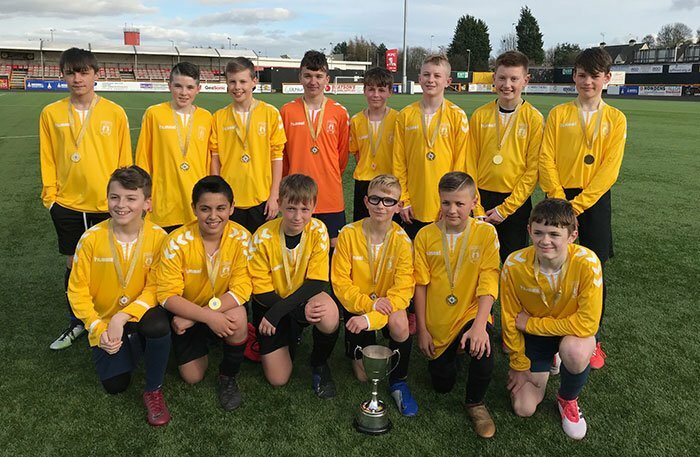 The Under 13 final for the Alloa Cup was between Lornshill Academy, Alloa and Denny High School. Graeme and St Mungo’s contested the league play off final in February and a tense five goal thriller took place. 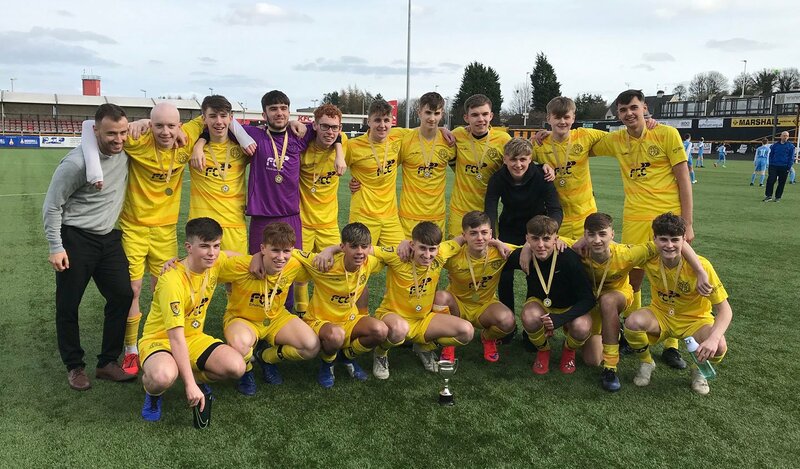 On this occasion, however, a rampant Graeme HS, who will play in the SSFA Senior Shield Final at Hampden on 26th April, overwhelmed their opponents with an emphatic victory. Graeme’s Scottish Schoolboy internationalist, Wilson Romanis was tripped in the box after only 20 seconds. Experienced ref Tom Cavanagh correctly pointed to the spot and Graeme’s other schoolboy cap, Jack Hodge made no mistake. After only three minutes Graeme netted again when Kai Wilson shot home. Before ten minutes Hodge had added a third goal to almost put the result beyond doubt. St Mungo’s HS international schoolboy, Tiwi Daramola, netted a fine goal to make the score 3-1 to give his team hope but Hodge scored from 18 yards for his hat trick goal and stretch his side’s lead. Five minutes from half time Hodge scored another sensational goal to extend the lead. The second half unfortunately for St Mungo’s continued as before with further goals being scored by Ryan McKay and Dylan Tennant before Blair Sneddon bagged a double. St Mungo’s kept going but found Graeme High in unstoppable form to lift the Falkirk Cup. The second final at under 13 level was understandably a much closer affair refereed by Lewis McGarry. Lornshill Academy found Denny HS keeper TJ Gibbs in good form and at half time the score was 0-0. Lornshill’s Josh Cairns scored after 12 second half minutes to open the scoring. Denny were unable to create a scoring chance and minutes from the end Hamish Campbell scored again after a poor clearance kick to secure a 2-0 victory for the Clackmannanshire school. Day two of the FVSFA finals is at Ochilview tomorrow from 1.15 when Dunblane HS meet Graeme HS for the East Stirling Cup u 14 followed at 3.45 by the Stenhousemuir Cup Final between Wallace HS and Grangemouth HS at u 15 level. Scottish Amateur F.A. | Scottish Juniors F.A. | Scottish Womans Football | Scottish Youth F.A. | Scottish Welfare F.A.